Are you going to your first triathlon and are a little lost about the rules? 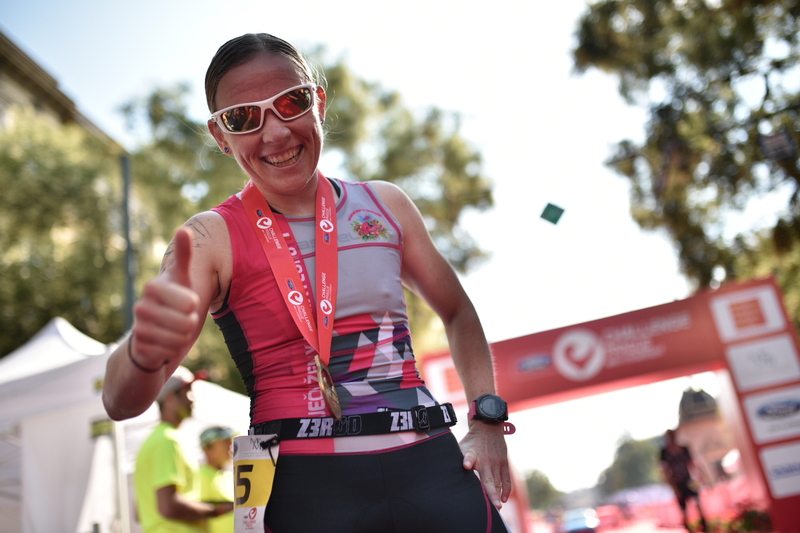 In this article, we want to focus on the preparation, the course of the race and the gear needed for completing the CHALLENGETRY-ATHLON. This is a race ideal for those who do not even dare a medium or long triathlon but would like to try the triathlon. The race will be ten times shorter than a long triathlon. (0.38 km, bike – 18 km, run – 4.2 km). According to this, the race is deliberately called – “TRY” because truly anyone can try the triathlon! 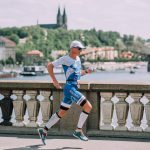 Unlike the main FORD CHALLENGE PRAGUE MIDDLE race, which is governed by the complete rules of the Czech Triathlon Association, the rules for the TRY-ATHLON have been modified so that everyone can participate in the race. We will now try to clarify your many questions about the course of the race and the gear, what items are and aren’t permitted on the track, and where to get your items ready for the individual parts of the race. We also recommend taking part in Friday’s race briefing on the Střelecký Island, where remaining uncertainties will be answered. Below you will find out what to put in each bag and where to place them before the race. After picking up your starting set and getting everything ready, you will place the bike and the colored bags in the transition areas and at the finish base. During the race we expect a water temperature of 17°C – 18°C. Neoprene is recommended at this and lower water temperatures. However, it is not obligatory during the CHALLENGETRY-ATHLON, regardless of the water temperature. If the water temperature is below 16°, the swimming track will be slightly shortened. If you don’t own a neoprene suit but would feel more comfortable in it (besides providing warmth in the water, it has moderate floating properties), you can rent it from the race partner, BeTri. You can reserve it HERE. If you’ve never swam in a neoprene suit, it’s good to try it out first, for example, during the warm-up swim in the Vltava River on Friday from 2:00 p.m. on Střelecký Island. Above all, removal of neoprene should be practiced and you should start taking it off on the way to the changing room while it still has water in it; otherwise the process is very difficult. The other racers will gladly help you zip it up, and you’ll do the same for them in return. Changing is allowed exclusively in the designated transition area (the tent) between the swimming and cycling and between the cycling and running sections. No other aids are allowed besides neoprene – snorkel, fins, sleeves and other floating aids, neoprene gloves and socks, etc. A swimsuit or neoprene suit are required (nudism not permitted), along with an official swim cap, identification bracelet and chip (you’ll receive everything in the registration package). You can have your own cap under the cap from the organizers, and swimming goggles are allowed during the race. Put your cycling clothes, a helmet (without which you won’t be allowed onto the track), and shoes in the red bag to which you have affixed your starting number. You can have your cycling shoes with the SPD cleat ready on the bike and clipped onto the pedals, just like the PRO triathlonists do. We recommend to fasten your own bottle of water or an iso drink on the bike, since there are no refreshment stations along the track. You can also have energy gels or a spare tire tube and brake pads fixed onto the bike; everything else belongs in the bag! After the swimming you’ll place the neoprene and the swim cap in the red bag; you’ll be able to pick them up after the race based on the number. After picking up the bike in the transition area, you have to run with it for a while. You can only get on the bike at the end of the area behind the red carpet marked with a tape or the word “stop”. Unlike the main MIDDLE race, drafting (or riding tucked closely behind another rider) is permitted in the CHALLENGETRY-ATHLON race. Therefore, it is allowed to race on a bicycle that is not dangerous for you or other participants for any reason (e.g. uncovered bar ends, damaged frame, dysfunctional brakes, etc. – will be checked at the entrance to the transition area) and does not have motorized drive. Electric bikes, time trial bikes, and aerodynamic helmets are not allowed. It is up to you whether you have toe clips, clipless pedals, or nothing on your pedals. 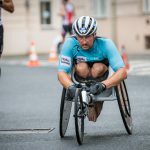 It is your responsibility to have the number stuck on the front of the helmet and below the bike seat, while also having the number on the triathlon band around the waist, a measuring chip at the ankle at all times, and an identification band on the wrist. Your clothing choice during the cycling is optional, but you need to have your upper body covered. We will tolerate an open jumpsuit or cycling jersey. Prepare the items for the run in the blue bag with an affixed starting number. Before the race, prepare the bag on your designated hook at Janáčkovo nábřeží at the end of the cycling transition area. Put your helmet and anything else from the cycling portion, which you no longer need, in the bag. The gear for the last section of the race is simple; you just need any running shoes. The number around the waist at the front of the band (you’ll be wearing it from the cycling portion, just move the number to the front), and keep the ankle chip and the wrist band. Choose clothing according to your own comfort, but nudism is forbidden for the entirety of the race, with at least part of the upper body covered. One refreshment station is waiting for you during this part of the race. Besides the great feeling of finishing the race and a crowd of congratulators and refreshments awaiting you, you will get a finisher medal on which you can have your name and time engraved. You’ll also receive the green bag with your number, in which you’ll have prepared a change of clothes for after the race. If you end up in the 1st, 2nd, or 3rd place in your category, come to the stage at the finish line on Vítězná Street no later than 10:30 a.m. for the announcement of winners. Ticket and bicycle release will be checked everywhere based on the main starting number or the ID band with the starting number. And then you just enjoy the pleasant feeling of a mastered challenge!